This weekend we finally got snow, and while most of us Vancouverites are total winter wimps, I admit to loving my Saturday night in the snow. We walked to the newly renovated Waldorf to celebrate a friend’s birthday and by the time we walked the 9 blocks, we looked like abominable snow creatures. But being outside while the snowflakes covered everything, including ourselves, made the late night so much brighter and beautifully quiet. Snow on the west coast is a novel and fun thing, but only because I know it’s temporary. And this morning I was happy to discover that almost all of the snow has melted and the sidewalks are no longer slushy danger zones. Blasts of winter are best when they’re short-term which is why I love Vancouver’s climate so much. This lentil dish is perfect for cold winter nights. It also contains fennel which has become one of my new favorite vegetables and is readily available all winter. If you wanted this to be a strictly vegetarian affair, just skip the sausage or trade in the meat for your favorite vegetarian sausage links and you’ll still have a fantastic meal. Serve with a crusty peasant bread and a bottle of red wine. Add the lentils into a medium-sized pot and cover with lots of cold water. Cover and bring to a boil and then simmer until tender, about 20 minutes. Meanwhile, heat the oil and saute the onion, fennel, red pepper, fennel seeds, and chili flakes until soft and fragrant, about 5 minutes. Sprinkle with salt and add in the kale and let that soften before adding in the sausage and let that cook for a few minutes, adding in some of the lentil water if it gets too dry. Drain off most of the water off the lentils, but keep at least half a cup or so and add it all into the sausage, kale and fennel mixture. Stir in vinegar and toss everything together. Adjust seasonings if needed and serve with crusty bread. Makes 4 main course servings. lately i’ve been on a sausage kick AND a kielbasa kick. but i need to make them in a more healthy way like you do. so, yeah this looks good. and hearty too! You know, I always thought that Vancouver was cold and snowy and freezing because of the Winter Olympics. I guess not! Tracy, I know exactly how you feel. Vanillasugar, it’s good to balance out all that sausage with some greens & legumes! Chihiro, Vancouver is surrounded by snowy mountains, but we don’t usually get snow in the city. Last year during the Winter Olympics it was the warmest winter & there wasn’t even much snow on the mountains – it had to be trucked in! Oooh, another great recipe. I just made zuppa toscana with kielbasa but I will make this next time, I can’t even remember the last time I had lentils. Lentils and sausage. I can’t think of anything more satisfying right now. Jamie Oliver has a recipe like this in his Italy book. I’ve been wanting to make it for ages, but my better half is not so keen on lentils. Perhaps sausage would sway him. I love all of these different ingredients, sounds delicious! My simple-meal fallbacks often tend to the boring (pasta with jarred sauce, anyone?). I love the idea of lentils and sausage because this dish looks simple, well-rounded, AND tasty. This might go into my weeknight rotation, Jeannette! I’m a total winter wimp. Don’t like snow and I don’t care for it. Born and raised in Toronto and I still can’t get used to winter. I’m living in the wrong province. Now this dish on the other hand, I can totally get used to. Rustic and tasty! Looks like my kind of meal. I’ve only just discovered your blog, but this looks fantastic. I can’t wait to try it out, and have a lot through your archives for more ideas. Thanks for sharing. I’m with you – snow in small doses, please. Ours stayed for a couple of days, which was weird. It usually is either snowing or melting, not just staying. This looks like a perfect warm-me-up meal. I’m such a huge fan of fennel. It’s a perfect seasoning for the winter months, when everything could use a bit of perking up. I also love a nice bowl of greens & legumes. So, this dish sounds pretty right on to me. 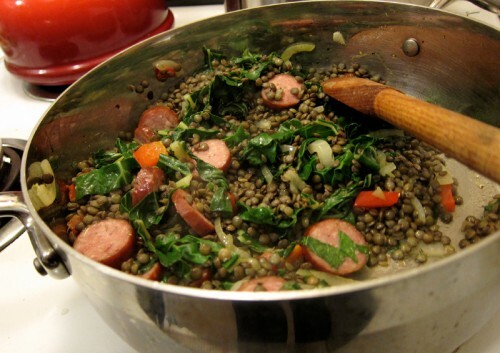 Love lentils…..can I use canned lentils for this, with bacon? yummmmm! this type of dish reminds me of home and spending time in my Grandma’s kitchen on cold afternoons 🙂 Thanks for this! mmmmm, greens and sausage. How can you go wrong with this? With crusty bread and red wine…. sounds like heaven! Kaye, I use lentils all the time and this is a great tasty way to get more into your rotation! Thanks Heather. Lentils are super versatile! Bijoux, yes, move over to this coast! It’s the best. Thanks so much Shirleen for stopping by & commenting. Your lentil meal sounds fabulous. Yes, maybe if you’re not used to eating beans & legumes you might get a bit gassy, but once you’ve gotten used to them, you won’t get so affected. Thanks Sprinzette! Enjoy your stay looking about! Lynn, our snow lasted one day before it melted and I love that! Lo, I’m so glad that I discovered fennel this year. So delicious! Joanne, yes you could add the canned lentils…just add them right at the end to heat up only – you don’t want them getting mushy. And for the bacon, cook it separately and then add it at the end as well. Eva, sounds like a great memory! Mmmm.. I could go for a big bowl of this right now. 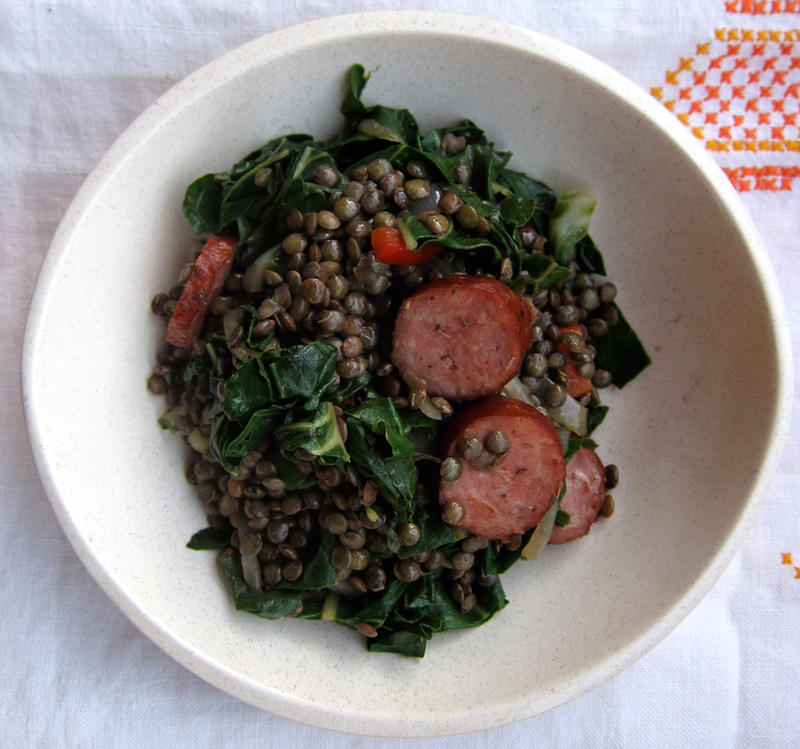 Now that I know you have a Dutch husband this meal makes sense – kale and sausage – a much beloved combination, I like the idea of lentils to jazz it up from the usual potato pairing. 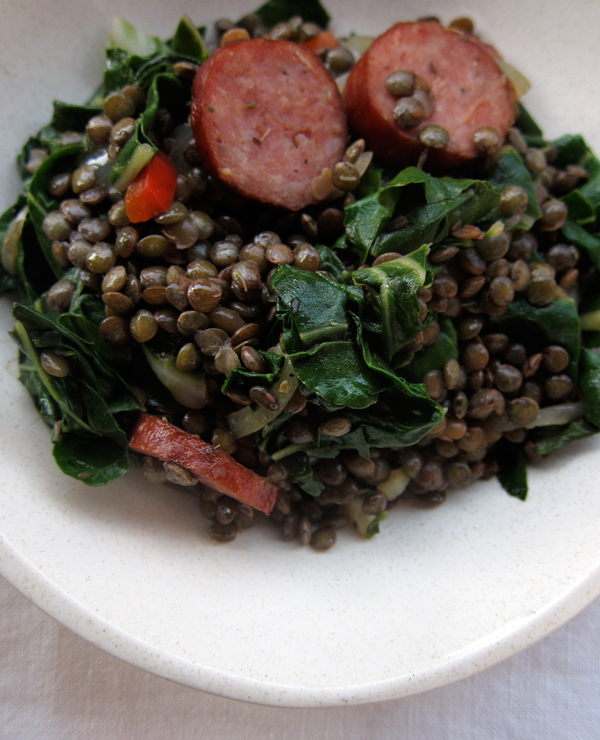 I love lentils with big hearty greens, and I’ll imagine the sausage gives it great flavor. What a perfect cozy meal and a winter night! This dish is beautiful and I love lentils! I feel like I am missing something with fennel. I had it once but wasn’t really a fan. I feel like I need to try it in something instead of as a side dish. Haley, is kale & sausage a dutch combo? I thought the dutch ate chocolates, cookies and nasi goreng! Sarena, try it again – trust me. I wasn’t too thrilled when I first tried it, but I’m now converted. I made this with vegetarian kielbasa and sprinkled a little grated parm on top and paired it with cornbread. VERY delicious- thanks! Susan, so glad you enjoyed this meal! I absolutely love your blog; your pictures are incredible and each of your recipes is so unique and look delicious. I am surely going to try this recipe on Sunday; thank you for sharing. Thanks so much for the lovely words, Healthy Apple! Great recipe. Do you think I can substitute chicken breast instead of the sausage. Terry, yes, it will be a different meal, but a delicious one still, I’m sure.